Forest Drive at Solomons Island Rd. (MD 2), Annapolis, Md. Part of the Baltimore-based Durkee chain. Features included outdoor patio seating, a lighted playground with seats and speakers next to it for the parents, and a screen whose advertised size was over 7000 square feet. Debut feature was Pete Kelly's Blues starring Jack Webb. Durkee also operated most if not all of Annapolis' indoor houses -- the Circle, Capitol and Playhouse. 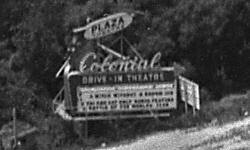 The shopping center that replaced the drive-in included a new indoor theatre, also called the Colonial; it is now the Annapolis Cinema Grill. A wide aerial view of the Colonial, from 1967. In foreground is the Plaza Theatre, built by Durkee the previous year. Below are close-ups of the snack bar and playground, and the marquee at the corner of Route 2 and Forest Drive. Source photo for above by Stu Whelan; from the Maryland State Archives. This online Boxoffice magazine article from 1956 includes ground/floor-level photos of the snack bar and playground, and an architect's drawing of the floor plan. 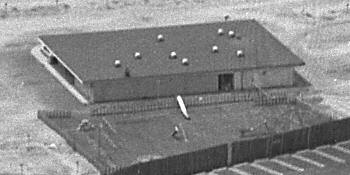 Click here to see an earlier aerial photo (circa 1957) of the drive-in and surrounding Parole area. An old racetrack is shown where the Parole Shopping Center would be built later, across from the drive-in. Courtesy of the Maryland State Archives.